Cambridge, MA – The center of our Milky Way galaxy is a mysterious place. Not only is it thousands of light-years away, it’s also cloaked in so much dust that most stars within are rendered invisible. Harvard researchers are proposing a new way to clear the fog and spot stars hiding there. They suggest looking for radio waves coming from supersonic stars. The long path from the center of our galaxy to Earth is so choked with dust that out of every trillion photons of visible light coming our way, only one photon will reach our telescopes. Radio waves, from a different part of the electromagnetic spectrum, have lower energies and longer wavelengths. They can pass through the dust unimpeded. On their own, stars aren’t bright enough in the radio for us to detect them at such distances. However, if a star is traveling through gas faster than the speed of sound, the situation changes. 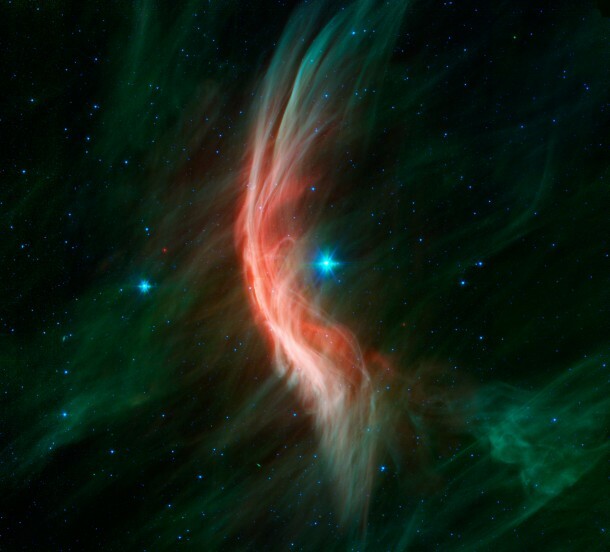 Material blowing off of the star as a stellar wind can plow into the interstellar gases and create a shock wave. And through a process called synchrotron radiation, electrons accelerated by that shock wave produce radio emission that we could potentially detect. “In a sense, we’re looking for the cosmic equivalent of a sonic boom from an airplane,” explains Ginsburg. To create a shock wave, the star would have to be moving at a speed of thousands of miles per second. This is possible in the galactic center since the stars there are influenced by the strong gravity of a supermassive black hole. When an orbiting star reaches its closest approach to the black hole, it can easily acquire the required speed. The researchers suggest looking for this effect from one already known star called S2. This star, which is hot and bright enough to be seen in the infrared despite all the dust, will make its closest approach to the Galactic center in late 2017 or early 2018. When it does, radio astronomers can target it to look for radio emission from its shock wave. “S2 will be our litmus test. If it’s seen in the radio, then potentially we can use this method to find smaller and fainter stars – stars that can’t be seen any other way,” says co-author Avi Loeb of the CfA. This work is reported in a paper authored by Idan Ginsburg, Xiawei Wang, Avi Loeb, and Ofer Cohen (CfA). It has been accepted for publication in the Monthly Notices of the Royal Astronomical Society.